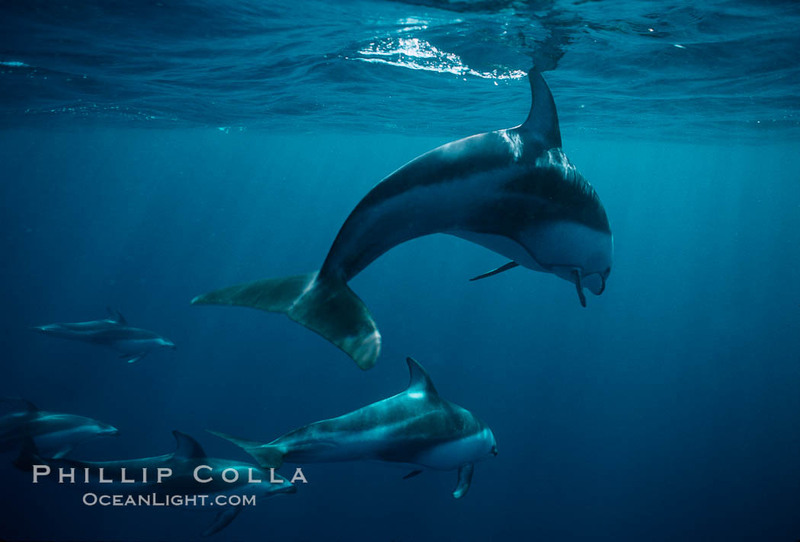 The first dolphins I ever photographed were Pacific white-sided dolphins (Lagenorhynchus obliquidens). This extremely fast moving species of dolphin often appears around San Diego in winter, but is normally found much further north ranging as far as Alaska and around to Japan. We would freedive in the open ocean and hope our presence interested the white-sided dolphins enough to swim by and investigate us. The first image I ever had that placed in a major photography competition (Nature’s Best, early 90s I think) was an image of a Pacific white-sided dolphin towing a piece of kelp. It would drop the kelp in front of me, wait for me swim toward it and then zoom by to take it again before I could reach it. Schooled by a dolphin … Psych! For those of you who have only used digital cameras: can you imagine trying to freeze the motion of a fast-swimming white-sided dolphin using ISO-64 in a relatively dimly lit underwater setting? That’s what we used to have to do. It was downright primitive.